Yes, I know it’s Thanksgiving and here I am already making a suggestion for Christmas dinner. But my turkey is in the oven, my house smells divine and I’m just full of food holiday happiness right now. A few weeks before Thanksgiving, I was toying with some ideas for a light Christmas dinner, and ended up with this incredible Roasted Sage and Pomegranate Chicken Recipe that was so flavorful and so good, I may end up making it again before Christmas. It was a very easy chicken recipe that required little prep and effort, but was incredibly flavorful. The average Points per serving for this roasted chicken is 8 Points. But, the Points may be a bit more or less depending on what part of the chicken you are eating. Also, please note that this is calculated with the skin off. I never eat the skin as it’s full of fat, so I only counted the meat (don’t worry…the sage butter is stuffed under the skin, so you won’t miss out on any of that deliciousness). I couldn’t believe how much flavor the meat picked up from the sage and pomegranate…it was truly delicious. If you are looking for an amazing Weight Watchers Christmas dinner recipe idea, this Roasted Sage and Pomegranate Chicken would be one heck of a contender. This insanely delicious roasted chicken is seasoned with amazing fall flavors and makes such and incredible dinner recipe. And it’s an easy chicken recipe that makes a great main course idea for Christmas dinner. In a small bowl, mash butter with garlic, sage and salt. Rub butter mixture evenly, all over chicken, making sure to get most of it under the skin. Stuff extra sage leaves inside the cavity of the chicken. Place chicken in a small roasting pan or baking dish. Add broth and 2 tbsp of POM juice into the bottom of the roasting pan. Place chicken in oven and roast for about 2 hours, basting chicken with the juices from the bottom of the pan every 30 minutes. While chicken is roasting, pour remaining POM juice in a small sauce pan, stir in pepper and bring to a boil. Reduce heat to medium, and simmer until juice is reduced to a syrup, about 15-20 minutes. Remove the chicken from the oven and pour ¾ of the glaze over the chicken. If the glaze has hardened, heat it over low heat until fluid. Let chicken rest for about 5-10 minutes before cutting. 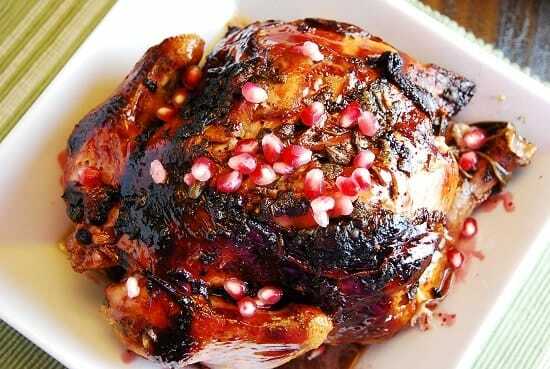 Pour remaining glaze over chicken, just before serving, and garnish with pomegranate seeds. Just note that the nutritional information and the Weight Watchers Points I’ve calculated for this recipe is based on the WHOLE chicken, with the SKIN REMOVED. I added up the stats from the entire chicken and then divided it by 4 servings. So, your Points may vary a bit, depending on whether you are eating breast, thigh, wing, etc. But most importantly, remove the skin!